“When you’ve finished that letter, Miss Remington, send a telex to the Nairobi office and collect my safari suit from the dry cleaners.” Miss Remington loaded a carbon paper triplicate onto the roller and set her fingers to work. That sweltering afternoon in the typing pool, her horn-rims sat heavily on the bridge of her sweet thin nose. My God, when are they going to invent the fax? she sighed. It is one of the more delicious contrivances of our age – the information age, according to palaeontologists – that all it takes on a Sunday evening of casual eBay activity is for your home wireless broadband to begin flashing a trillion nanoelectrons through the dark fibres and suddenly you arrive, in half an eyeblink, back in 1972. Back to the days of hopeful youth when, wild-eyed with discovery and oblivious to all but the latest Cream LP, you cast the mores of your parents onto the jokepile of history, along with the mantlepiece trinkets, the porcelain spaniel, the little Chinaman pulling a rickshaw turned in matte black wire. Now you spend hours on eBay trying to find that trash again. Ok, not the sausage dog draught excluder that didn’t quite make it into the Design Museum. But, as the past disappears further down the tunnel, you find yourself wondering whatever happened to this or that piece of tat, each one a cipher of who you were back then. And there is no lost object more precious than my old typewriter. An Olivetti Lexikon 80, heavy as a bus and never a line out of kilter. It came home one day when the typing pool in my father’s office went electric and changed my life. A teenager with a sudden purpose, I typed volumes of sleuth stories and heartfelt poems that the world is still not ready to accept. The steady mechanical resistance of the keys helped regulate my racing thoughts. Tippex came in paper strips not bottles. Look, if this is just some meander down memory lane, I’ve got other places to go. Point taken. My theorem approaches. It occurred to me, watching my own teenage children this weekend engage in personal text message marathons and five hour sessions updating their 1,382 close friends on Facebook with regard to how Sophie Pluke Year 12 is like well minging, that never before in civilisation has so much writing been produced. So much writing! Not exactly Shakespeare though, is it? Well, it is the privilege of every generation to accuse the next of intellectual weakness and low moral standards. Has been since Cain, if not Abel, turned out so wrong. Certainly, Sophie Pluke is the cause of Broken Britain. Yet, however linguistically crp our children’s txt mssgs are, it cannot be gainsaid: the kids is suddenly all about writing. The last time young people were writing as prolifically as this, they were called Shelley and Byron, not Chel and Ryan. It’s a miracle. It happens only twice a millennium. Naturally, my theorem acknowledges that quantity and quality traditionally exist in inverse proportion to each other. It is true that my daughters and their pals do not have the benefit of a lumbering typewriter to add thoughtfulness to their thoughts – their fingers dart over miniature keypads like electric eels. But the quality of their writing may improve, as they come to invent the CVs they’ll need if they’re ever to find a job. Meanwhile shouldn’t we just be heartened that people still find words are valuable in their lives? Our children are clamouring to communicate, and this should not be taken for granted. Remember the recent alternatives – in descending primate order – grunting Goths, glued-up punks, hippies stoned out of their tree. Interesting how the demand for training at work changes with the times. In the 80s, you couldn’t run enough courses in negotiation skills (“Got any dirty tricks, mister? How do I screw the other side?”). In the 90s, it was back-to-back workshops on constructive teamwork and partnering (“We are delighted to collaborate…”). For the past ten years, communication has been the must-know. Now that Blackberrys have descended and taken over the planet… forcing humans in a two-hour stand-off today on Wall St to prove they know the alphabet… hacks like me are suddenly being quizzed on life’s burning issues, such as: what’s a comma really for? Who’d have thought it? Rampant Nanotechnology Heralds Resurgence of Semi-colon Debate. You read it here first. 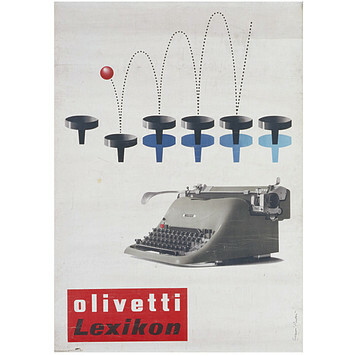 Footnote: What happened to my old Olivetti Lexikon? Like a fool enthralled by the space race, I dumped it in a skip during the optimistic purchase of an early Amstrad computer, when Alan Sugar was an attractive foetus. Confirmation of personal stupidity. And then, six months ago, I saw my old typewriter for the first time in twenty years. Where? Sitting majestically on a plinth in the Design Museum. No sausage dogs in sight. This entry was posted on FebruaryFri, 12 Feb 2010 10:50:46 +01005012am10 24 AMpFri, 12 Feb 2010 10:50:46 +010050Friday 09 at 10:50 am and is filed under Uncategorized. You can follow any responses to this entry through the RSS 2.0 feed. You can leave a response, or trackback from your own site.